Why ambient? 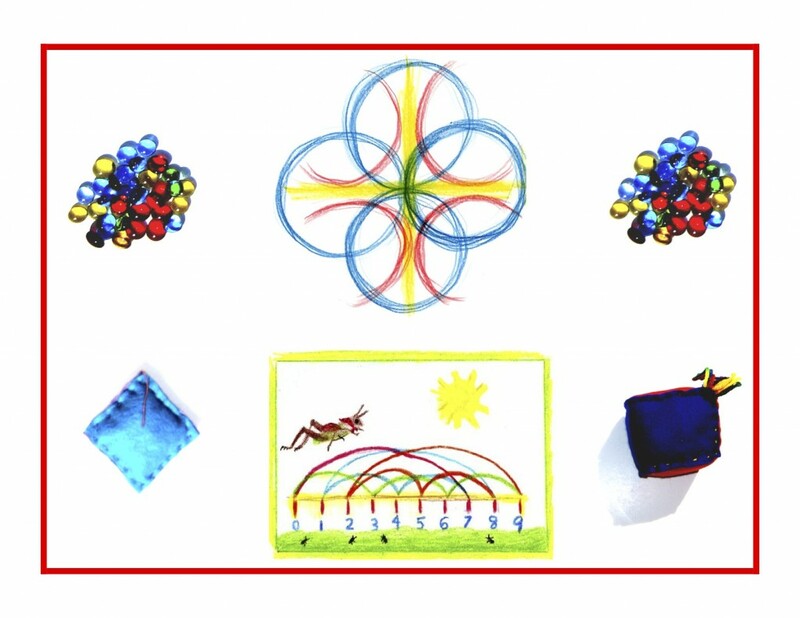 A math teaching style that’s whole and all encompassing, with themes that repeat many times through the years, is most likely to be effective and successful. Because the Common Core Math Standards for Grade 1 address addition and subtraction only, they will not appear here until the Grade 1 math blocks 3 and 4. Math blocks 1 and 2 focus on meeting the numbers up close and personal through stories, movement, art, and hands-on activities like making real numbers. Today’s post will be devoted to moving the numbers on a circle. 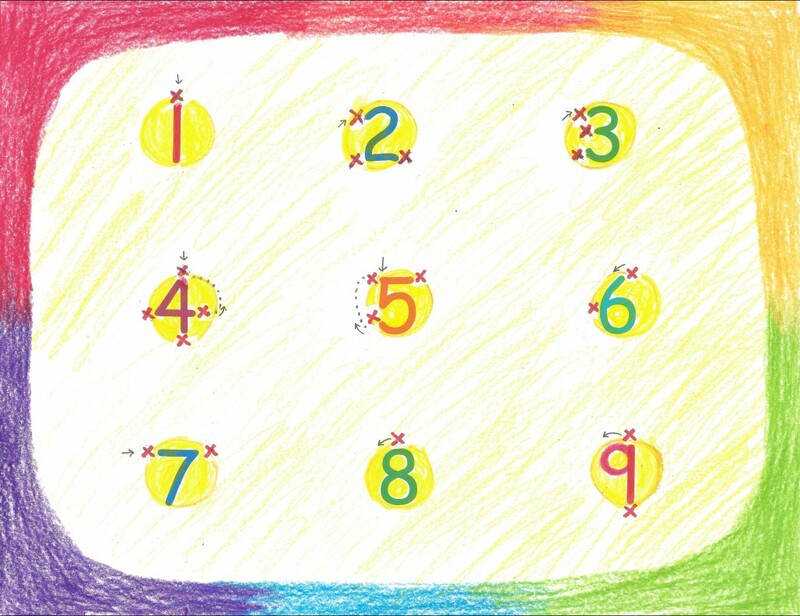 As shown in the illustrations below, the numbers and letters can be physically experienced, making them “bodily known” rather than memorized or understood only intellectually. Trace a large circle (at least 4 feet in diameter) on the floor indoors or outdoors on asphalt or sandy ground. Here’s an easy way to make a large circle: using a piece of twine or yarn that’s half the diameter of the finished circle (i.e. 2 feet for a 4 foot circle), tie one end to a pencil and the other to a piece of chunky chalk. Place the pencil and string in the center of the circle and have someone hold it there. Trace the circle with the chalk while holding the twine taut. This could happen after the numbers or letters have been introduced through stories and illustrations. 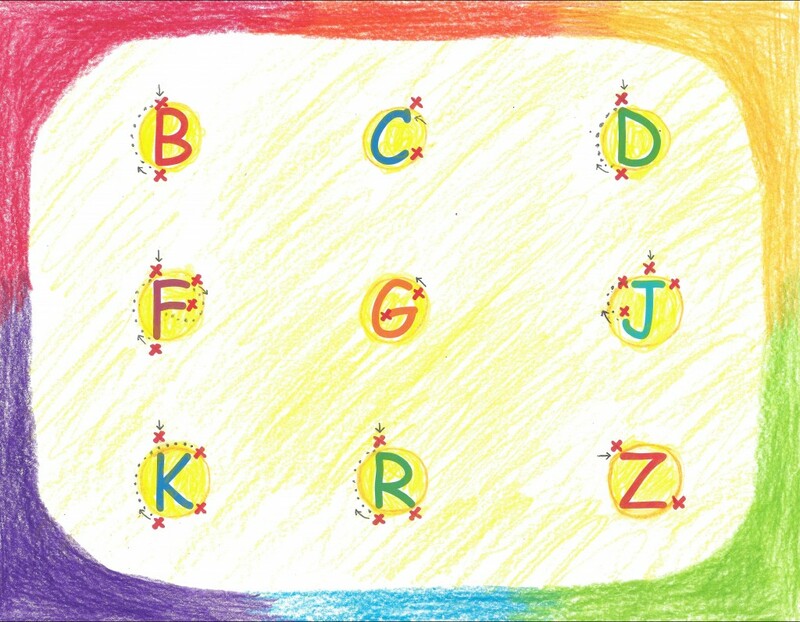 Have the child(ren) place beanbags (indicated by the red X’s) on the circle where the number or letter starts and stops, whether on the circle or not. Then have the child(ren) walk or run the number form. Note that the arrows show direction and starting points, and the dotted lines indicate “tip toe steps” where it’s necessary to go back to the top (or side) to continue the number or letter. This can help with correct formation and preventing reversals. PS, just noticed that the 1 and 7 are missing their ending beanbag red X’s. The perfect part of me wants to go back and redraw and rescan. But the sensible part wins tonight: the “PS” will do the trick . . . Beyond practical purposes though, this sort of activity provides a context for learning and gives the child an edge, that of feeling ownership toward what’s being learned. Joy is such an integral part of wholesome teaching and learning, and this is truly a joyful process. No bored, sad faces or lack of energy here. Watch for smiles, laughter, and bounding through the forms with lively vigor (NOT rigor)! And remember always that knowledge ensues in an environment dedicated to imaginative, creative knowing, where student and teacher alike surrender to the ensuing of that knowledge as a worthy goal. More Grade 1 numbers tomorrow . . .